Although not exactly basking in sunshine, Gosport CP had a great day at the Stubbington Fayre on Bank Holiday Monday 27/08/18. It was the first outing for this year’s Christmas stock and the CP branded calendars were popular from the start of the fayre with customers making purchases while the CP team were still setting up. 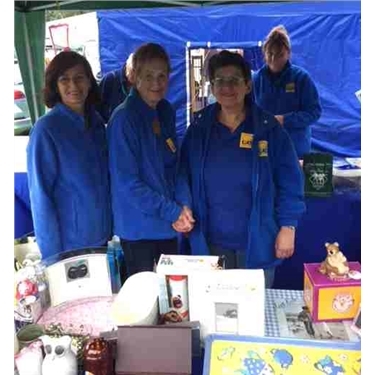 A varied selection of things for sale from jigsaw puzzles, children's games to cross stitch kits and cat carriers meant there there was something for everyone and pets too. We are so appreciative of your donations for our sales tables as those new and nearly new goods make such a difference. Thank you to volunteers Sandy, Jan, Chris, Kate, Jo, Heather, Paula, Toni & Carol and transport by David & Ian, for giving up their bank holiday and also to everyone who made purchases or donations. In total we raised £512.28 - a brilliant result!